“Meet and Greet (Welcome Party)” for medium and long term exchange students as well as short term international students from Andalas University, Indonesia was held in the Global Village on the afternoon, Wednesday 10 October. “Meet and Greet” has been held twice a year, one in the first half and the other in the last half of the year since 2016 for the purpose of building better relationships with President and Vice President by eating lunch and enjoying conversation. After President Arakawa's welcome address, on behalf of exchange students Huang Yanyu from National Central University, Taiwan and Nurfadhillah AL Munawwarah from Andalas University, Indonesia, greeted respectively in English and Japanese. 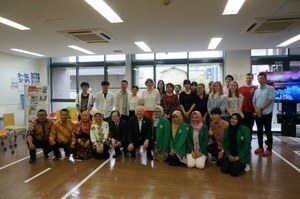 With a toast by Vice President Odanaka who is in charge of global exchange, luncheon started in a friendly atmosphere. 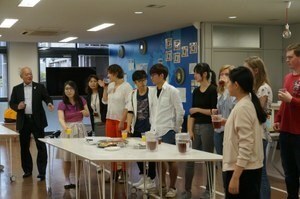 The students not only enjoyed conversation with President and Vice President but also got to know Osaka City University Global Members (OGM) who served MC in this event as well as other international students.